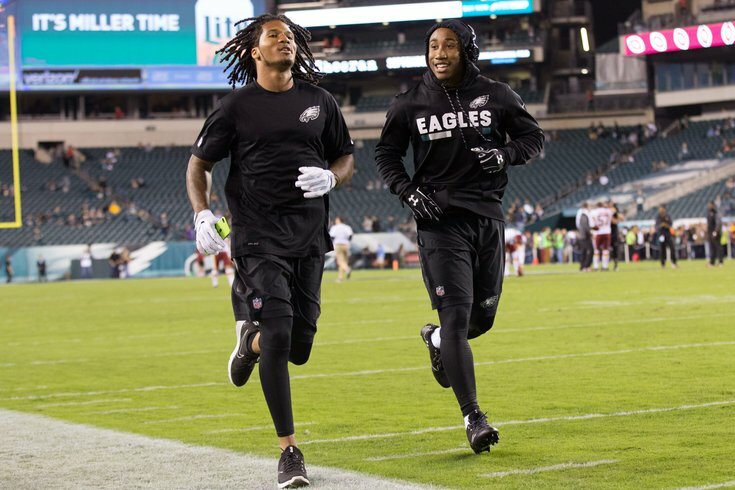 Philadelphia Eagles cornerbacks Ronald Darby (right) and Sidney Jones (left). For the first time since he was available to come off Injured Reserve, it actually seems like there's a chance rookie cornerback Sidney Jones (Achilles) is activated. "Again, that's one of the spots we'll have to take a look at this week and see where he's at physically," head coach Doug Pederson said Monday. "I know he's healthy and all that, but listen, he hasn't taken a hit in a long time, too. It will be day-to-day. I want to see where he's at at the end of the week." That's a big change from previous weeks when Pederson was quick to shut down the idea of the second-round pick seeing his first action of the season. Of course, the Eagles could decide to keep him on the shelf heading into the playoffs. This week marks the last stretch of practices that Jones can participate in without being activated to the 53-man roster. Jones is currently still on the non-football injury list. The Eagles started practicing Jones on December 13, which means his 21-day window ends on January 3. The Eagles have until then, at the latest, to either activate him to the 53-man roster or shut him down for the rest of the season. As you'll see, there was a lot of this following Monday's game. If you’re an Eagles fan and you’re completely comfortable with their position as the start of the playoffs nears, it’s likely you’re not being honest with yourself. Either that or you’re simply seduced by the numbers. Someone will have to go to Philadelphia at some point during the NFC playoffs and beat the Eagles. But the Minnesota Vikings, New Orleans Saints, Carolina Panthers and Los Angeles Rams seem perfectly capable of doing that. If those teams were watching Monday night, they had to be delighted by what they saw from the Eagles. Foles needs the reps – but will he get them? Doug Pederson said he'd take a day-to-day approach when it came to deciding playing time against the Cowboys, but after his performance on Monday night, it wouldn't hurt to get Nick Foles a few more reps before he has to face an actual playoff team. Of course, you also don't want to get him hurt – although backup Nate Sudfeld is likely to get his first NFL experience on Sunday – so Pederson will have to be careful with how he balances that in the season finale. "Well, if that's the approach, then I would have rested him last night, quite honestly," Pederson said Monday when asked about placing a priority on Foles' health. "I can't worry about that. I got to play and get him as many reps as he can, and then be smart about it. "We have a lot of football left. Our season really is just beginning, quite honestly. But we'll be smart and make good decisions there as a coaching staff. [I’ll] talk to the coordinators about play time and all that. We'll have a good plan later in the week." Lane Johnson didn't seem too pleased following the win, especially with those three penalties he was called for against the Raiders. The Eagles’ offense produced only one touchdown. And Johnson was flagged twice for second-quarter penalties, one for holding that negated an 11-yard Nelson Agholor catch. He was also penalized for holding in the third quarter. None of the penaties would push him into apologizing for the effort. Indeed, it thrust him onto the offensive. After sacking Raiders QB Derek Carr, Eagles DE Chris Long suffered what the medical community refers to as a brain fart, one the could've cost the Eagles points and driven fans crazy. Luckily it didn't, because seeing him run off the field while the ball was on the turf right behind him was actually kind of hilarious. His explanation? That might be even funnier. The Raiders fumbled their desperation lateral, and the Eagles returned it for a defensive touchdown. After that time-expiring score, instead of kicking the extra point with Jake Elliott, Doug Pederson opted to kneel. Luckily most bettors avoided the carnage since the Raiders closed as 10-point underdogs, but the same cannot be said for fantasy owners.